I think I’m having all my good news for the year in the first few months! Thrilled to have my poem Lesley placed first by poet Stuart Patterson in the Prole Laureate Poetry Competition. The best I hope for above all is to write a poem that achieves what I hoped for it and this feedback from Stuart has warmed my heart! A very real, touching, human poem encompassing a wide range of emotions and perspectives in such a short space. It’s spare, well crafted but not short on a punch and connecting us to a moment of equal horror and hope. This isn’t lazily reflective or self-indulgent poetry; these are words & images that take us right to the very terrible end of something which is forever linked to the beautiful beginning of another, dark mirror images, the nubs of life and death. I was very moved by its simplicity, humanity and truth. Thanks to Prole for the opportunity and Stuart Patterson for the thoughtful and kind comments. You can read the poem here. I’m beyond a reet bit (as we say in Sheffield) chuffed to receive The Sarah Nulty Award for Creativity at the first Women of Sheffield Awards last night courtesy of the Sheffield Star – celebrating local women who have had an impact. It was an honour to stand alongside some truly inspirational women of all backgrounds, ages and powerful stories –from engineers and scientists, to health and sports professionals – including my fellow culture fertilisers, Justine Gaubert and Sara Hill. The award is for 20+ years of service enabling others creatively – with a passion that’s continued to grow through my career – helping young people to reach their potential. I had rocky younger years, leaving home at 15 and muddling through from an early age, and I believe that set something alight in me in terms of my values and trying to provide others with what was lacking in my own experiences growing up. I’m honoured it was in memory of the beautiful spark that was Sarah Nulty (the engine behind the Tramlines Festival for many years), and bravely and beautifully presented by Sarah’s mum Julie who gave me the best hug I’ve had in a long time – sorting me out after the stage fright of standing in front of an audience while someone talks about you and you wonder where to look. Although I never met Sarah I know she had a huge impact in her short time on this earth. Isn’t that one of the best things we can hope for in this life, to have made a difference, however small, in our corner of the planet? There are many of us quietly doing this kind of work in creative fields, and anyone who is will know the impact of creativity and everything it brings. Sadly it’s a field that is often underpaid and undervalued, and run (in the upper echelons) by the wrong people (like most things! ), but those of us who know its impact keep at it and I salute you all. And if it’s not you, but you see one of us grafting or struggling – please do what you can to let us come through and do our job. We need allies and key holders in every nook and cranny so we can keep doing what we do without becoming exhausted. The best part of the award was that people, particularly young people – (you know the generation they say are apathetic) took the time to write in and nominate me (I know who some of you are now! Thank you) the words and the gratitude you’ve expressed have made my heart soar. Some of you I haven’t worked with in years, others I still mentor years on. Some of you have even gone from babyface to beard in the time I’ve known you! Thank you so much for a beautiful gesture and all the thoughtful things said. They are deeply appreciated. So this award is for all the other creative women out there who are the grafters, the enablers, the game-changers, the neuro-divergent thinkers, those who do it for the love not the glory, the survivors of cancer, of illness or allsorts – who keep standing up and holding your hand out to others. And for Sarah and all the other beautiful women that have made ripples that continue to last. Thank you to everyone who made this happen including the Star, especially Ann Holmes and Nancy Fielder, and to Karen Breckon of Meadowhead Flowers for the beautiful bouquet of local wildflowers, so lovely! And to all who nominated me including: Nik Perring, Warda Yassin, Justine Gaubert and all who believe in me. My heart is yours! Finally… (And I say finally because we have been trying to finish some kick-off content since mid-August! )…working with creative partner in crime, copywriter and social entrepreneur, the mighty Justine Gaubert – it’s great to say – www.hastagnolfiter is now live. The project is a space for ideas, research, musings, interviews and anything else that might crop up, or take our interest, in the realm of neurodiversity – particularly relating to females and creativity. If any of that sounds of interest, please check it out. You can listen to our intro podcast at the bottom of this post. I haven’t blogged in a while because autumn is always a super busy time for me. The Hive project has been refunded (yeh!) and there’s a lot to get off the ground there, and it’s the annual Youth Word Up project that I deliver for Off the Shelf Festival of Words – this year will be its 7th year, which I can’t believe! With HashtagNofilter now up and running, it’s time to start thinking about my writing again which has taken a back seat for quite a while. I’ve got a poetry getaway planned for early November which I’m so glad I spent the time to sort before I got busy. I knew it would be much needed by then (I already feel it is now!) Other possible happenings in the pipeline, but for now, I hope you’re enjoying the autumn, or another season, depending on where you are in the world! 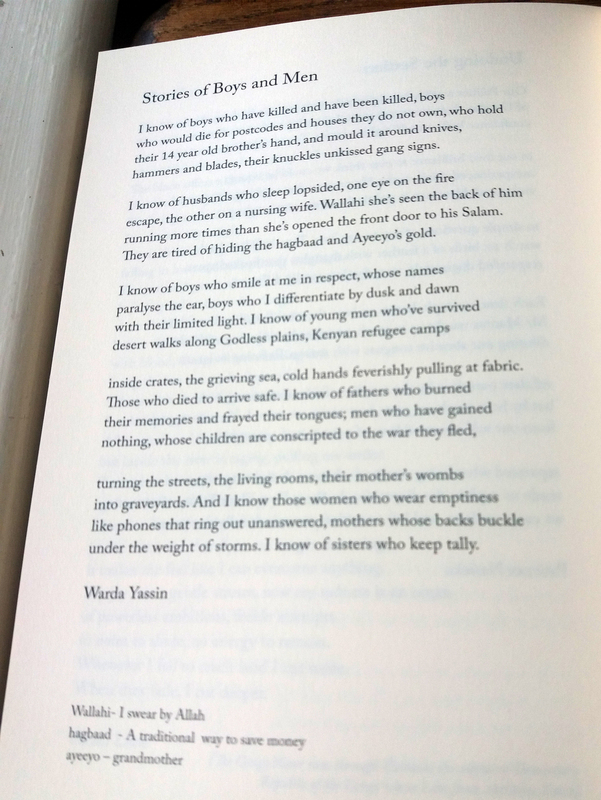 I’ll leave you with this stunning poem from a wonderful young poet, Warda Yassin, who I’ve been working with for 5 years now. Finally, her confidence has broken through to the other side, and her work is now being recognised (She won a Poetry Business New Poet’s Award 2018) Enjoy! (Click image). I’m not long back from a creative residency at the wonderful Studio Faire in the South of France, working on a new project with fellow creative, Justine Gaubert – copywriter, social entrepreneur and good friend for some years. The time away was much needed and gave us the space and focus to get cracking on a new project we’re working on together looking at all things relating to neurodiversity and creativity. There’ll hopefully be writings, musings, podcast discussions and interviews and we hope to create a space to explore ideas, strategies and research. Exciting stuff! More info coming soon. The rather amusing photo was taken by Colin Usher, co-founder/owner of Studio Faire, and no word of a lie, the dogs, Becca and Dougie, got so, shall we say, ‘excited’ (well Dougie anyway) with our laughing during the shoot, he let us all know. Classic! halfway smile is here and available to buy! I have so much enjoyed editing this wonderful collection of 73 pieces of poetry, short story and flash by emerging South Yorkshire young writers (14+). The range and quality is really up there and among them are Hive award winners Warda Yassin, Eloise Unerman and Georgie Woodhead, and the winners of our inaugural Hive Young Writers’ Competition, open to young writers from across the region. Do grab yourself a copy and support us (Hive) to continue supporting young writers. A massive Happy Birthday to the NHS for being amazing full stop but also saving my life in 2015 and giving me superb treatment for breast cancer. My treatment was gruelling at times and lasted for a whole year, but I met so many incredible doctors, nurses and hospital staff, even down to cleaners. Sheffield’s Weston Park cancer hospital is amazing and the staff, many of whom have worked there for many, many years, are so dedicated and good-spirited despite the difficulty of working on the front line for cancer. We are immensely lucky to have our health service and boy, when you really need it, then you know what appreciation for it is. All of us, if we ever get ill, especially with something like cancer, we want to know there is a multidisciplinary team made up of everyone from oncologists to radiologist to surgeons to research nurses meeting to discuss and make decisions on each patient individually. We really do have the very best care, as good as anything private. It blows me away what the NHS did for me and I know if I get ill again in future, I’ll once again be lucky enough to be in their care. At least I hope! Happy 70th, here’s to another 70 and to keep going when I’m long gone! Here’s Harry Leslie, Barnsley War veteran, remembering life and social health care (there wasn’t any) before the NHS. And the first days of the NHS. Hello blog! Long time no see! I say hello blog because I don’t think anyone is reading this 🙂 How time flies as always. It’s been one thing after another (as is the nature of life), but I just wanted to pause here a minute and say – I’m so pleased that the lovely young poet that is Warda Yassin, is a winner of the New Poets Prize 2018! I’ve worked with Warda since late 2012. She is one of the sweetest, humblest, loveliest young souls I’ve had the privilege of working with, and it brings a tear to my eye to see how far she’s come and that her talent is being recognised. She so deserves this prize and her work in print (in 2019!) I really can’t wait! For more info click here. I’m seeing so many of the young writers starting to take off through Hive and it’s just the best feeling ever. There is nothing that beats the feeling of helping someone realise they have wings. Eloise Unerman, is young poet in residence at the Ledbury Poetry Festival this year, and we have another young writer who’s been highly commended for a big award announced later this month. And there are too many others to mention who are slowly unfolding their feathers and looking up to the sky. On the topic of writing, I’ve fired mine up again and have been getting some submissions out there (it’s been a while!) It’s never easy to juggle running a big project with your own writing and creativity. I’ve accepted it comes in waves. The important thing it to try and ride one when they come along. Happy June to you all! Photo: Me, Warda & Eloise at the wonderful Motley Muse at Huddersfield Uni recently.